Carnival party supplies and party favor ideas for your carnival birthday party ideas. Get the games and the game prizes ready because that is what this kind of kids party is all about. There are so many different ideas you can use to make your carnival the best kids party on the block. What are you going to find here? All the help and ideas you need to plan, prepare for and host a fun carnival party. We've got ideas for the decorations, the supplies and party favors, the games and how to make your own carnival games, the game prizes and last, but not least the desserts. When you are thinking about decorating for the carnival let's take a step back and think...what does a real carnival look like? The ones I have been to always have a ticket booth to pass through when you go in and there are many game booths. Then there is a food section where you can buy carnival foods like hot dogs, burgers, funnel cakes, popcorn, cotton candy and the menu goes on and on. Some carnivals even have fried twinkies! The colors red and white stand out when you are planning a carnival. Hang some red and white bunting from your deck or your fence to brighten up the area. To really put everyone in a carnival mood you can find food wrappers to put your hot dogs, popcorn and cupcakes in, so take a look at the Oriental Trading Company . Back to what the carnival looks like. If you want to set up a carnival in your yard use shower curtains with different patterns to hand on your fence. In front of each shower curtain set up a different party game. Try to find festive and fun curtains to use. You can put each of your games on a folding table in front of the shower curtain to make it look similar to a carnival booth. Cover the table with a red or a red and white striped table cloth. It is not the "Real" thing, but it is close enough. When everyone starts playing those fun games they will have a great time...and that is what matters! You can find some great carnival party supplies. The plates, cups and napkins are only the beginning of this fun theme. There are a couple different photo props you can use to take pictures of your guests...and they are great fun. Take a look at us! 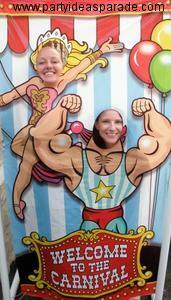 This carnival photo prop is only 8.99 and it is a huge success at a party. Everyone wants to have their picture taken and you can find some cute circus tent photo frames to put those party pictures in. What a great favor idea. And it is fun how many times have the party favor really been a lot of fun? All your carnival games are going to need prizes and that is another time the Oriental Trading Company comes in very handy. They have the best game prizes on the web. 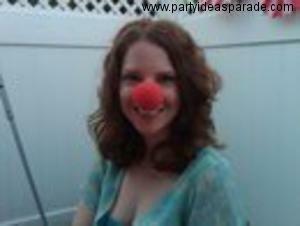 You can find some fun and silly clown noses, some temporary tattoos, some bouncey balls, inflatable and stuffed animals. Plus lots of carnival fun like Big Top temporary tattoos, swirl lollipops and how about some inflatable balls or animals or even some stuffed plush animals...just like at a real carnival. You can also use leis from the luau party!